Design trends change on a regular basis, and you’ll want to be up with the most current ones to keep your customers happy. Marble floors have been in style since the ancient Romans, and that trend won’t change in the future. This is because marble is so attractive, durable, and elegant. However, the trends for 2017 are pointing towards more color combinations and patterns. While you can still make your customers happy with a field of matching tiles, you may want to consider some of these subtle and bold design choices. Large rooms need definable spaces to make them feel more welcoming. Your clients may prefer to use area rugs, but a central pattern will stand out more and give the room a truly impressive feel. To make this work, you’ll want to use sharply contrasting colors like Emperador Brown Dark Marble and brilliant white Bianco Dolomiti. This trend is more than just a large border set in the seating area. It relies on interwoven tiles that form a contrasting pattern within the border. A coordinating medallion sets off the center of this highlighted area. The more intricate the pattern is, the more your customers will love the look. You may want to have an artist assist you with the design for your showroom so that you can develop something that’s both unique and outstanding. Another option for large rooms is to use individuals squares in a contrasting color. An excellent color combination would be Pietra Gris Montana, a black marble, along with the softer white tones of Crema Bella. While most of the floor will be Crema Bella, you’ll use the black marble to create a windowpane effect across the floor. This is not the same as a harlequin or checkerboard pattern because the white tiles will completely surround each black one. It’s an easy way to work in contrasting colors without overwhelming the space. This design choice is most effective when coordinating colors are used on the walls or as countertops. It’s a great option for massive kitchens that need a little more interest on the floor. It works well with square tiles of the same size, and you can make a powerful statement using 24-, 18-, or 12-inch-square options. It’s easy to lay down tiles that are all the same size, but you’ll be able to achieve a more impressive finish by combining different sizes. This is the right choice when your clients want something more interesting while maintaining a monochromatic finish. You can work up a range of different patterns using 12-inch and 18-inch square tiles combined with rectangles. Bring out the pattern more by finishing this off with a contrasting grout color. You’ll create a very relaxed and elegant look that’s still welcoming. The herringbone style is particularly hot right now, and it hinges on using long rectangles to send a zigzag right across the floor. In addition to being a top choice for floors, it’s also popular with shower walls and other vertical areas. Achieving this look is actually quite easy. You can order tiles that are custom cut to suit your needs, or you can cut the 24-inch tiles into strips on site. Lay the first few tiles in a V- pattern, and then build out from there. Whether you go with contrasting grout or not, you’ll be able to clearly see the pattern on the floor. The color options you choose will make the difference between an understated floor and one that commands attention. Mixing shades of gray into a random pattern can lend a fun element to a formal room. Using coordinating colors in a monochromatic theme will take any basic room to a higher level. It’s an appropriate finish for every space from the foyer to the kitchen and formal sitting room. Turn your tiles to a 45-degree angle and you can make any room feel more impressive. Alternate colors for a whimsical look that will help break up a large space. If you really want to make an impression, then set contrasting tiles inside larger ones for a shrinking diamond pattern that will truly impress. Start with a 24-inch square tile of Emperador Brown Dark Brown. Cut out a windowpane in the middle and set an 18-inch tile of Calacatta Gold inside the brown marble. Cut another windowpane inside that tile and fit in a 12-inch square of Rojo Alicante. Alternate the color combinations as you go across the floor so that you can create a truly magnificent pattern that will delight your customers and set your company apart from the competition. One of the simplest trends is also the most popular. Manufacturers are now producing tiles that leave the 12-inch standards of the past in the dust. Large and bold 24-inch tiles go down fast and require less grouting. They make small rooms feel larger and will allow you to put the perfect finishing touch on small areas. They’re being put to use in all types of projects, so you’ll want to maintain a healthy inventory of them. Available in all styles and colors, they can be used for your kitchen renovations, new bathrooms, and commercial jobs. 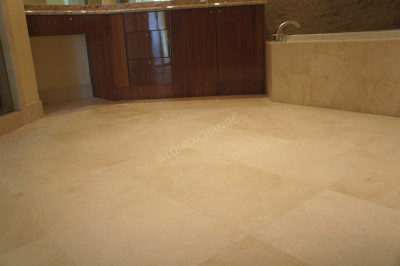 When buying marble, choose a reputable wholesale supplier. Nalboor is able to offer consistent inventory along with great customer service. Our wholesale rates will help you keep costs down, and we offer special pricing structures for bulk orders. Visit our online showroom today to see what marble styles we have in stock, or call us directly to start the order process. We’re happy to provide you with free samples of our products so that you can see the color and quality for yourself. When it comes to the design trends of 2017, we have the marble products you need to stay competitive and ensure that your customers are completely satisfied. Call us today at 305-501-4548 or contact us online.